Mass Audubon is the largest conservation organization in New England. It operates a statewide network of 43 wildlife sanctuaries that protect more than 32,000 acres of land. Supported by more than 100,000 members, its education programs attract 200,000 children and adults annually, and its advocacy efforts influence environmental policy at local, state, and federal levels. 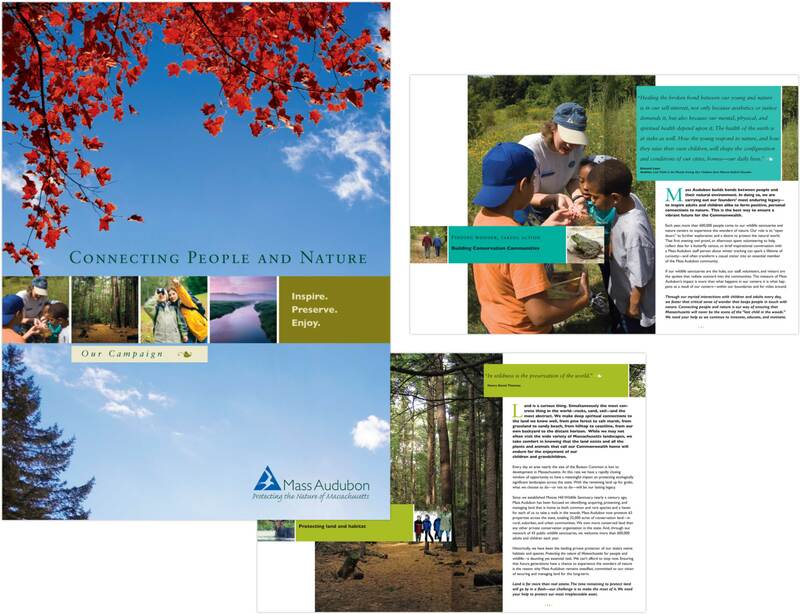 We collaborated with Mass Audubon staff and leadership to evolve a verbal and visual communications program to support a $55 million campaign to “protect the nature of Massachusetts”—by increasing both the breadth and depth of connections people have with Mass Audubon. We are working to position Mass Audubon as the “best place to invest” if you care about the Commonwealth’s diverse habitats and animals—and the (necessary and desirable) experiences that adults and kids have with nature. And beyond helping to realize the Campaign’s monetary target, we’re focused on leveraging the Campaign to raise the entire organization to a higher level of awareness, understanding, and connection. An extensive research and investigation phase yielded three key challenges. The first was around transforming relationships. An organization with 100,000 members is obviously well versed in managing “transactional” relationships (memberships, annual fund, etc.). However, membership does not equal major gift investment. Many of these members are connected to Mass Audubon through a specific touch point: the sanctuary in their town, the program their kids attend, etc. Migrating individuals from “transactional” relationships to “major gift investment” requires both deepening their connection to the specific offering while also providing greater context to support understanding of the organization as a whole. The second challenge was to differentiate Mass Audubon from the myriad other conservation-minded organizations operating in and around New England. Many of them have long histories and are very effective communicators and fundraisers. 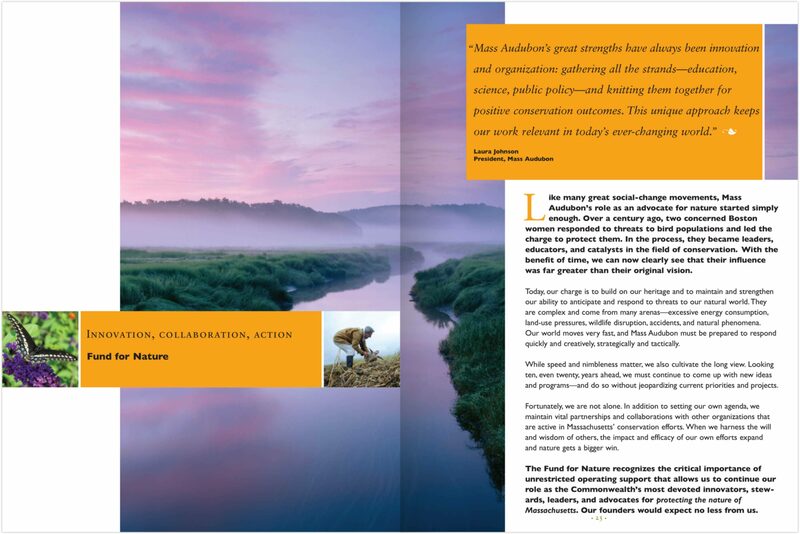 Answering the question “why Mass Audubon?” was vital. Thirdly, our research showed that people connected to / valued the environment in many different, often personal, ways. Campaign communications allow different “ways in” for donors and prospects with varying priorities and values, and support dialogue rather than “one-off” conversations. To address these challenges, we’ve developed a suite of main messages that underscore Mass Audubon’s differentiating qualities. 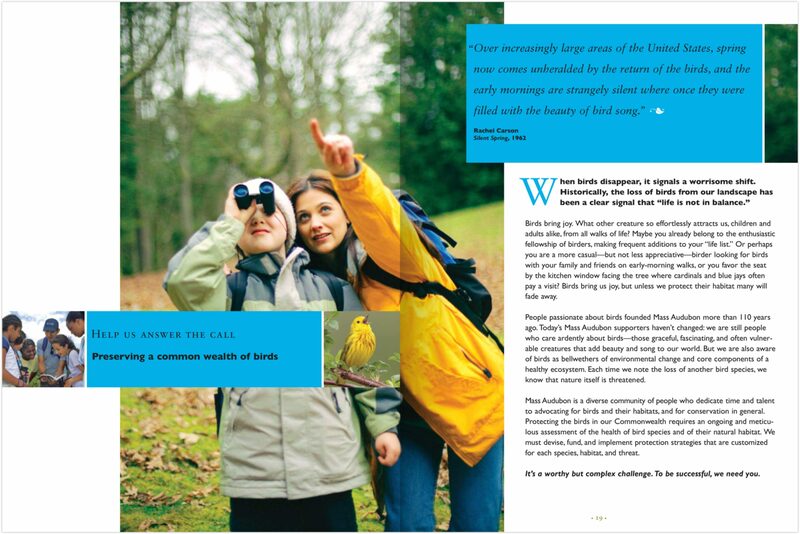 And we’ve developed a values-based system of more specific messages: people who care about birds may or may not be the same people who care about global warming—or about educating kids. The new communications meet people where they are. Prospective donors will give because their vision is aligned with Mass Audubon’s. The case statement is a flexible kit; the casebook was designed in a compelling and scannable format that allows prospects to see themselves in the story—and to understand that their participation can change the story. It was also written and designed knowing that people take in information differently: some prospects are moved by facts and figures, some are moved by Mass Audubon’s history and vision for the future, and others are moved by personal stories. The case statement balances (both visually and verbally) a vision for the future with real threats and challenges that lay ahead. Emotional and technical messages are also finely tuned to find the right balance. Pre-printed sheets and templates allow a development officer to add more specific information—tailored to the opportunity.